What are the obstacles and opportunities in rural areas to achieving a “Cashless India”? On 8 November 2016, India’s Prime Minister Narendra Modi issued a demonetization policy not only to eliminate black currency, but also to promote a digital and cashless economy. The “Cashless India” and “Digital India” initiatives propose to reduce corruption at all levels of society by enforcing the use of cards, checks, or mobile phones for all transactions. To set the stage for a “Cashless India,” Modi launched the Jan-Dhan Yojana (JDY) scheme in August 2014, which allowed all Indians to open bank accounts free of charge and with zero balance. 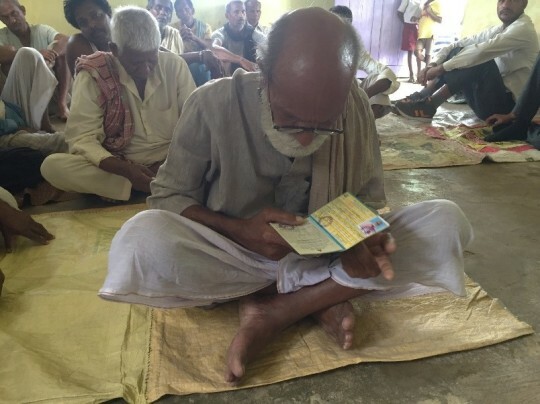 After eliminating monetary constraints to banking, the government required citizens to have an Aadhar card (unique identification card) to receive rations from the Public Distribution System (PDS). The result of these initiates is the formation of Jhan Dhan-Aadhar-Mobile, or “JAM” trinity, which links bank accounts, Aadhar cards, and mobile phones. The goal of JAM is to reduce inefficiencies and leakages in the PDS. More importantly, the government expects JAM to set the stage for a transition from the provision of food grains through the PDS to direct cash transfers, a heavily debated policy shift. The radio, television, banks, telecom service providers, and government are promoting “Digital India,” even among farmers in rural areas. However, several infrastructural and behavioral barriers to carrying out this vision still remain. According to the “Digital India” initiative, there are several cashless transaction tools and services, some of which are relevant to the rural poor. The most obvious is a bank debit card or credit card, such as a Visa or MasterCard. Another tool is a pre-paid bank card, which is similar to a gift card with a certain amount of money on it. Pre-paid bank cards are commonly used by companies to dole out salaries to a large number of employees. Mobile phones and the internet, platforms for online transactions and banking, are also major tools in a cashless economy. Internet banking, or Netbanking, is one type of online service, but there are also a number of mobile applications. Each bank has a United Payments Interface (UPI) application, which allows customers to transfer money easily between multiple bank accounts. Additionally, there are mobile wallets such as PayTM, Freecharge, Jio Money, etc., which link to customers’ bank accounts directly. Most recently, Modi has launched the Bhim application, based on the UPI, which allows instantaneous transfers between bank accounts. Catering to the rural crowd, there are a few services that help people in remote areas receive or make payments. One is a micro-ATM, a handheld device, which costs far less to set up than a regular ATM and allows customers to make a range of transactions and transfers, as well as withdrawals. Another is the Aadhar Enabled Payment System (AEPS), which allows people to make a transaction at a micro-ATM or any other Point of Sale (PoS) machine with their Aadhar card. Post offices are also available for banking services. Finally, there is the Unstructured Supplementary Service Data (USSD), where a person can dial “*99#” on any basic mobile phone to inquire about their bank balance or even transfer funds. In late March 2017, only a few months after India’s demonetization and related reforms, I had the opportunity to visit the Munger District of Bihar, one of four district locations where TCI is working to implement its Technical Assistance and Research for Indian Nutrition and Agriculture (TARINA) project. The purpose of my visit was to investigate the ground-level realities of a cashless economy in a rural part of India, including the feasibility of cashless transactions and the penetration of cashless tools. During my field visit, I conducted exploratory research through focus group discussions (FGDs) with agricultural laborers, as well as farmers with marginal, small, and medium plot sizes in three villages within Munger’s Dharhara Block: Lakarkola, Bourna, and Ragunathpur (see the table below for more details). Lakarkola is a predominantly tribal, or Adivasi, village, while Bourna and Ragunathpur consisted of mixed castes. The average respondent age was 40. Across the board, all respondents reported having bank accounts and Aadhar Cards. Very few complained that distance to the bank is a problem. On average, the closest bank or ATM is about three kilometers away. Respondents reported that instead of ATM cards, they mainly use bank passbooks to withdraw cash from their accounts. This problem is likely to be resolved with the younger generation. Some farmers indicated that their children help them with all bank related matters, which may enable them to eventually learn the new system for using ATM cards. Most respondents indicated that their transactions are still entirely in cash. The only exception are cashless payments received from the government for their wheat or rice, which are directly deposited into their bank accounts. However, many complained that these payments are often very late. Although all respondents claimed to have bank accounts, very few reported using mobile phones for banking or making payments. Unlike in urban areas, where shopping and paying bills can be conveniently done online using a smartphone, it appears that people in rural areas still find it more convenient to use cash. Moreover, some respondents perceived a “Cashless India” or “Digital India” as only relevant to people who are educated enough to use mobile phones or who make transactions with large sums of money. enough money,” said an older agricultural laborer in the Bourna Village. that the government is proclaiming to bestow. when applying for a KCC. and use in rural regions. such as the perception that cash is safer to use or the issue of literacy. infrastructural support in the form of micro-ATMs and reliable electricity. may very well be conceivable in the coming years. Specialist at TCI’s TARINA Center of Excellence, based in New Delhi, India.